With a project entitled "Flush Efficiency" the St. Martin Secondary School won the Dominica leg of the SAGICOR Visionaries Challenge on Wednesday last week. 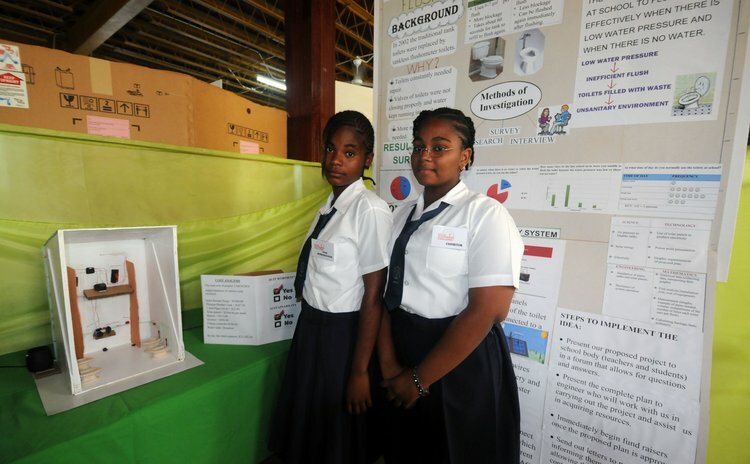 The Dominica Grammar School (DGS) placed second with a project showing the positive effect of sulphur on crops in Wotten Waven, one of Dominica's sulphur-rich communities. The Convent High School received third place with their "Eco Tree Dine" project. The winning entry depicted an environmentally friendly way of flushing toilets when water is inadequate. Seven Dominican schools participated in the exhibition held at the Goodwill Parish Hall. Speaking at the opening of the exhibition, Cheryl Rolle, General Agent of SAGICOR Life Inc. said the Visionaries Challenge was established to encourage young people to think of innovative ways that can sustain the region. "It is to solve problems facing our communities and it is also to make school more practical. A lot of times you may wonder why you are at school and you may be bored but if you see something that is practical and applicable and can blend in with the Maths and the Science that you are doing, doesn't that make it more interesting?" she asked. The Visionaries Challenge, which was conceptualized by SAGICOR Life Inc., the Caribbean Science Foundation in partnership with the Caribbean Examination Council (CXC), involves secondary school students who have identified a challenge facing their respective schools and using STEM (Science, Technology, Engineering and Mathematics) developed effective, innovative and sustainable solutions to the challenge identified. The Challenge is being implemented in Anguilla, Antigua and Barbuda, Barbados, Belize, Cayman Islands, Dominica, Grenada, Guyana, Jamaica, Montserrat, St. Kitts and Nevis, St. Lucia, St. Vincent and the Grenadines and Trinidad & Tobago. The regional leg of the competition takes place in Barbados on April 12, 2013. Prizes in the local competition include a computerized technology centre and science kits for the school One student representative will also travel with a teacher to Florida for an all-expense paid STEM related tour which includes visits to the Kennedy Space Centre, the Museum of Science and Industry, Disney World's Epcourt Theme Park and the Patal School of Global Sustainability.